Encourage the spirit of Mother’s Day every day! As children, there’s so much to be grateful to mums for; we can see a mother's love for her children through the little things, as well as the big things, she does for them. Yet her love and dedication are recognized only once a year on Mother’s Day, predictably with a card, a crafted gift, or perhaps flowers with dad’s help. What if children, and even the whole family, lived up to the spirit of Mother’s Day every day of the year through little acts of love? 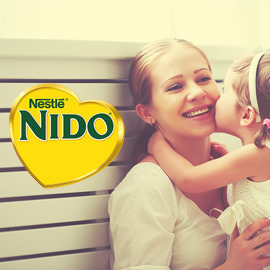 NIDO is the world’s number one milk powder brand. Mums trust NIDO to provide the best nutrition for their children throughout their growing years, to nurture a healthy future for them. And NIDO believes that the world would be a better place if children were encouraged to show mum their love and gratitude every day. Today, NIDO is looking for your insight and creativity to show the spontaneous little acts of love that children can do for mum every day, not just on Mother’s Day. Create an original and engaging video and help NIDO spark a movement where children surprise and delight mums with little acts of love. Good luck and spread the love!